The draw for the last-16 of the competition has thrown up just one all-Premier Division tie. Cork City's Garry Buckley and Kieran Sadlier celebrate after their victory over Dundalk in the 2017 FAI Cup final. 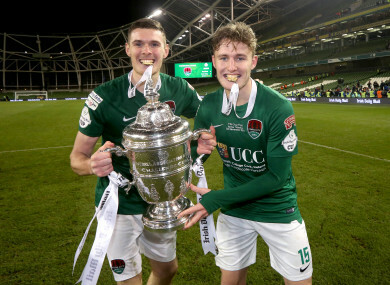 CORK CITY WILL again face non-league opposition as they continue their bid to win the FAI Cup for the third consecutive season. The 2017 double winners, who began their campaign with a 5-1 victory away to Home Farm, are to host Maynooth University Town in the second round. The draw, which was made this evening, will see the FAI Intermediate Cup holders take on another Cork club following their 2-0 defeat of Leeds AFC. While seven Premier Division clubs remain in the competition, the draw threw up just one fixture that features two sides from the top flight. That will be the meeting of Derry City and St Patrick’s Athletic. Both sides had comfortable first-round wins over non-league clubs: 12-2 against Blarney United and 5-0 against Inchicore Athletic respectively. Following their 3-0 win over Cobh Ramblers, Dundalk will have home advantage against Finn Harps, who eliminated Premier Division strugglers Bray Wanderers. Drogheda United’s reward for upsetting Shamrock Rovers is a home game against Waterford, while Longford Town — who also accounted for top-tier opposition in Sligo Rovers — will play host to Shelbourne. The ties are scheduled to be played on the weekend of 24-26 August. Email “Holders Cork City to host non-league opposition in FAI Cup second round”. Feedback on “Holders Cork City to host non-league opposition in FAI Cup second round”.